Assessment of physical activity in a free-living environment is important for understanding relations between physical activity and health and determining the effectiveness of interventions. Techniques include behavioral observation, questionnaires in the form of diaries, recall questionnaires and interviews, and physiological markers like heart rate, calorimetry, and motion sensors. The doubly labeled water method has become the gold standard for the validation of field methods of assessing physical activity. Then, questionnaires show a low reliability and validity but can be adequately applied as an activity-ranking instrument. The heart rate requires individual calibration to be an effective method to assess physical activity only at group level. The indicated method for the assessment of habitual physical activity in daily life is a doubly labeled water validated accelerometer. Future developments are simultaneous measurement of body acceleration and heart rate for the assessment of physical fitness. A new generation of accelerometers will provide information on body posture and activity recognition to allow objective assessment of subjects’ habitual activities, options for a healthy change, and effects of the follow-up of any changes. Insight into the interaction between daily physical activity and health requires an objective and reliable method for the assessment of physical activity in free-living subjects. The method should be suitable to measure physical activity over periods long enough to be representative for normal daily life, with minimal discomfort to the subjects, and applicable to large populations. There are a large number of techniques for the assessment of physical activity, which can be grouped into five general categories: behavioral observation, questionnaires (including diaries, recall questionnaires and interviews), and physiological markers like heart rate, calorimetry, and motion sensors. Validated techniques of estimating habitual physical activity are needed to study the relationship between physical activity and health. The greatest obstacle to validating field methods of assessing physical activity in humans has been the lack of an adequate criterion to which techniques may be compared. The interrelation of various field methods may be of some value, but because there are errors in all methods it is impossible to determine the true validity of any one of them in doing so (Montoye et al. 1996). However, calorimetry, more specifically the doubly labeled water method, has become the gold standard for the validation of field methods of assessing physical activity (Melanson and Freedson 1996). Then, physical activity is defined as body movement produced by skeletal muscles and resulting in energy expenditure (Caspersen et al. 1985). Doubly labeled water is an excellent method to measure total energy expenditure (TEE) in unrestrained humans in their normal surroundings over a time period of 1–4 weeks (Speakman 1997). The principle of the method is that after a loading dose of water labeled with the stable isotopes of 2H and 18O, 2H is eliminated as water, while 18O is eliminated as both water and carbon dioxide. The difference between the two elimination rates is therefore a measure of carbon dioxide production. The deuterium (2H) equilibrates throughout the body’s water pool, and the 18O equilibrates in both the water and the bicarbonate pool. The bicarbonate pool consists largely of dissolved carbon dioxide, which is an end product of metabolism and passes in the blood stream to the lungs for excretion. The rate constants for the disappearance of the two isotopes from the body are measured by mass spectrometric analysis of samples of a body fluid: blood, saliva or urine. The simplest sampling protocol includes the collection of a baseline sample before drinking the water, an initial sample after the water has equilibrated with the body water, and a final sample after 1–4 weeks. Converting carbon dioxide production to energy expenditure needs information on the energy equivalent of CO2, which can be calculated with additional information on the substrate mixture being oxidized. Subsequently, physical activity can be expressed in terms of energy expenditure by a combination of TEE with a measurement of basal energy expenditure (BEE) by a ventilated hood. Then, physical activity can be calculated as activity-induced energy expenditure (AEE = 0.9 × TEE − BEE) or as physical activity index (PAI = TEE/BEE). The calculations assume that the third component of TEE, diet-induced energy expenditure, is a constant fraction of 10% of TEE in subjects consuming an average mixed diet that meets energy requirements (Westerterp 2003a). Behavioral observation is one of the earliest methods to assess physical activity. It has evolved by direct entry of data in a computer (McKenzie 2002). The method exceeds other measures of physical activity in providing contextual information as well. Disadvantages are that the method is time consuming, the presence of an observer might interfere with the activity behavior of the subject and the classification of observed activities, especially activity intensity, is subjective. There are no doubly labeled water validations available in literature, possibly because observations do not last for intervals of 1 week or more as required for the application of the doubly labeled water technique in humans (Speakman 1997). Activity questionnaires, including interviews and diaries, are the most common tools for the assessment of physical activity. The methodology is cheap and allows application in large populations. Despite the large-scale application, reliability and validity of the measurement of habitual physical activity by questionnaires is low (Shephard 2003). Comparisons with doubly labeled water show generally low correlations with systematic underestimates (Staten et al. 2001; Arvidsson et al. 2005; Maddison et al. 2007; Rush et al. 2008), overestimates (Koebnick et al. 2005; Mahabir et al. 2006), or agreement at the group level with considerable error on an individual level (Bonnefoy et al. 2001; Conway et al. 2002; Washburn et al. 2003). Probably, questionnaires can be adequately used as an activity-ranking instrument. Then, a short questionnaire can have already surprisingly good results (Wareham et al. 2003; Johansson and Westerterp 2008). Heart rate monitoring is one of the first objective methods for the assessment of physical activity. Validation studies generally include 2–4 days continuous heart rate monitoring during the 7–14 day observation intervals with doubly labeled water. Observation days were weekdays as well as weekend days and results are weighted in a ratio according to the doubly labeled water interval. Studies apply individually assessed heart-rate energy-expenditure calibration equations for the estimation of daily energy expenditure, where equations comprise two linear regression lines, one for heart rates below and one for heart rates above the average value for sedentary activities; the so-called flex heart rate. The results of 11 different studies were reviewed in 1999 and 2005 (Westerterp 1999; Torun 2005). The total energy expenditure assessed with heart rate monitoring was not different from total energy expenditure assessed with doubly labeled water at group level in all studies. However, individual differences were large as shown by the SD of the mean. The reported extremes ranged between −17% (Livingstone et al. 1992) and 52% (Livingstone et al. 1990). The heart rate monitoring is an objective method. However, the heart rate is affected by more factors than physical activity; data conversion needs individual measurements of heart rate in combination with oxygen consumption. Nowadays, the heart rate is applied especially as an indicator of activity intensity (Rennie et al. 2005). A new application is the measurement of the heart rate in combination with body movement as a measure of physical fitness (Plasqui and Westerterp 2005, 2006). Those with a higher level of physical fitness can generate more activity at a lower heart rate than unfit subjects. Additionally, the combining heart rate with accelerometry as described below, may improve precision of physical activity measurement. However, the general shortcoming of heart rate monitoring over longer time under free-living conditions still is the data quality (Brage et al. 2006). Motion sensors are the most promising for the assessment of physical activity. Sensors can be applied in free-living subjects over prolonged periods of time. When equipped with a data memory to store information on body movement, they can also be used to study patterns of physical activity in time. Various sensors have been developed from mechanical devices to electronic accelerometers. Accelerometers can provide information about the total amount, the frequency, the intensity, and the duration of physical activity. Eight different devices have been evaluated with doubly labeled water as a reference (Plasqui and Westerterp 2007). However, most of the studies should be interpreted with care. The validity is generally based on a comparison between accelerometer output and doubly labeled water assessed energy expenditure in a multiple regression analysis with subject characteristics as additional covariates. 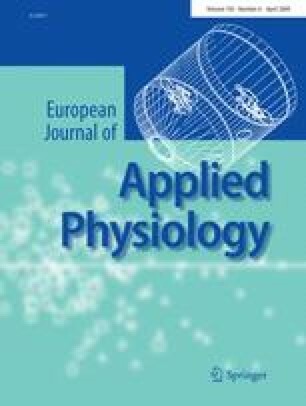 The separate contribution of accelerometer counts to the explained variation in energy expenditure is often not presented and standard errors or limits of agreement are large or not presented. The best results were found for the Tracmor (Philips Research, Eindhoven, The Netherlands), a device with the first published doubly labeled water validation (Bouten et al. 1996) that is expected to become commercially available shortly. The method of choice for the assessment of physical activity is a function of several parameters. The five methods described above were ranked on six parameters including subject interference, subject effort, providing information on activity context, providing information on activity structure, the objectivity of the data, and the time and cost involved in the application (Table 1). The ranking is a summary of the comparative description of the separate methods. Studies on physical activity and daily energy expenditure show that activity-induced energy expenditure as a percentage of average daily metabolic rate varies from five in a subject with a minimal activity level to 45–50 in a subject with a high physical activity level (Westerterp 2003b). At the average reported physical activity level (PAL), where total energy expenditure is 1.75 times basal energy expenditure (Schulz and Schoeller 1994; Black et al. 1996; Westerterp and Speakman 2008), activity-induced energy expenditure is one-third of average daily metabolic rate. Observations of the activity pattern with motion sensors combined with determination of PAL values with doubly labeled water can be used for a more direct estimate of the contribution of high intensity activity to average daily metabolic rate. We recently showed that subjects with a PAL ranging from 1.51 to 2.04 spent on average 9% of the active time in high intensity activity (Westerterp 2001). In a multiple regression analysis with the fraction of time spent at activities with moderate- and high-intensity, only moderate-intensity activity came out as a significant predictor of PAL. The data clearly showed that in the normal PAL range, the distribution of time spent on activities with low and moderate intensity determines the activity level. High activity does not have much impact as a determinant of PAL in the normal population. An average subject with a PAL of 1.75 spends, respectively, 65, 25 and 9% of the active time in low-, moderate- and high-intensity activity. When the ratio of the energy costs for low-, moderate- and high-intensity is 1:2:4, high-intensity activity contributes about 25% to AEE. Thus, methods for the assessment of physical activity should be sensitive for the detection of low- and moderate-intensity activity. Another approach is the comparison of the daily time budget with the daily energy budget of a subject with the average PAL of 1.75 (Fig. 1). In the time budget, 75% of time is devoted to activities with a MET value lower than 1.75 like sleeping, lying down, sitting and standing without movement, and 25% of time to activities with a MET value higher than 1.75 like standing active i.e., washing dishes, walking, cycling and running (Fig. 1a). In the total energy budget, the energy associated with the lower and higher intensity activities has a nearly 50–50 distribution (Fig. 1b). In the activity-induced energy budget, energy associated with activity during sitting and standing is on average similar to energy expenditure associated with the more dynamic activities like walking, cycling and running (Fig. 1c). Accelerometers, more specifically tri-axial accelerometers, are the only devices with sufficient sensitivity to detect the small movements during sitting and standing. Physical activity is a function of genes and environment. A twin study, in which habitual physical activity was measured with doubly labeled water and a tri-axial accelerometer for movement registration (Tracmor, Philips Research, Eindhoven, The Netherlands), concluded additive genetic factors to explain 72–78% of the inter-individual variation in habitual physical activity (Joosen et al. 2005). This implies that genetic variation determines to a large extent whether a person is prone to engaging in physical activities, something that was also concluded from twin-studies in which habitual physical activity was assessed using questionnaires (Kaprio et al. 1981; Lauderdale et al. 1997; Carlsson et al. 2006). Many studies aim to detect intervention-induced changes in physical activity. Then, it is important to know that physical activity is mainly determined by predisposition and not by interventions from the environment. Thus, intervention-induced changes in physical activity are generally small and require sophisticated techniques to quantify. Supervised exercise training programs, as evaluated with doubly labeled water showed non-training activity was not affected by exercise training in young subjects (Westerterp 2008). However, in elderly subjects, exercise training induced an equivalent compensatory decline in non-training activity. Similarly, activity-induced energy expenditure was reduced during energy restriction and in patients with chronic disease increasing resting energy expenditure. Studies with exercise training showed the reduction is difficult to overcome. A new development is the use of accelerometer sensors to identify activity types with classification algorithms (Zhang et al. 2003, 2004). Methods are based on several accelerometers positioned in different body parts like chest, legs, and feet, to identify different movements and postures. In a further development, identification of activity types has been investigated using one single acceleration sensor, placed on the waist or on the chest (Karantonis et al. 2006; Ermes et al. 2008). Then, the overall classification accuracy is lower but wearing comfort is much higher. The ultimate accelerometer allows detection of activity type and activity intensity. Ainsworth et al. (2000) categorized dynamic activities such as walking and cycling into light, moderate or vigorous intensity depending on movement speed for the estimation of energy expenditure. There is a linear relationship between accelerometer and energy expenditure, however, this linearity is valid only within one single activity type (Hendelman et al. 2000; Midorikawa et al. 2007). Trunk mounted accelerometer systems can be used to assess speed of movement (Schutz et al. 2002). Nowadays, the most accurate method to measure walking, running and cycling speed in daily life is based on accelerometers and global positioning systems (Schutz and Herren 2000). However, those systems have limited wearing comfort and are still too expensive to be used in large-scale studies (Tan et al. 2008). The ultimate single sensor with a sophisticated algorithm to track the type, duration and intensity will never fully cover all aspects but might be preferable over a multisensor system, interfering with the parameter to be assessed. The indicated method for the assessment of habitual physical activity in daily life is a doubly labeled water validated accelerometer. Questionnaires, as a self-report method, can be adequately used as an activity-ranking instrument. Simultaneous measurement of body acceleration and heart rate can give information on physical fitness. A new generation of accelerometers will provide information on body posture and activity recognition to allow objective assessment of subjects’ habitual activities, options for a healthy change, and effects of the follow-up of any changes. Yin B, Goris AHC (2008) Continuous recognition of daily physical activities using a single triaxial accelerometer. http://www.icampam.org/downloads/ICAMPAM-Conference-Book-web.pdf.